How can I be the best coach I can be for this client? What attributes would make me a better coach? How can I make the coaching process as smooth and beneficial for this person as possible? But coaching is a two-way street. If we all want to get the most out of any experience we have working with a coach, then there are a number of things that we can do as coaching clients to improve the experience, to get more benefit from it and to reap greater results. What it is to be a good client. This is an often overlooked topic. Whilst the option of online coaching carries many positives (e.g. selecting a coach you feel “suits” you, rather than being stuck with whoever lives in your hometown), it also has disadvantages over in-person coaching. It can be harder for the coach to get an accurate read of you (body language, in-person conversations, etc.) and so effective communication and honesty is even more important. There a number of things that you can do to be a better online coaching client and in turn maximize your results and “get more out of your coach”. You are not the only person that your coach deals with on a daily basis. So there isn’t going to be an unlimited amount of emails or messages you can exchange in a day. So to make sure you get the information you really want (and need), take the time to think through your questions, comments or responses and make them as concise as possible. Here at Sigma we commonly encourage emails and messages to be formatting in a way that they can be read easily (often in a bullet point format) and wording of questions should be clear and easily understood. If you find yourself sending long-winded paragraphs of sentences that don’t make sense, then a quick fix is to attempt to put that email into something that can be said in a few clear sentences. You’ll usually find that you will end up making pretty much the same point, but in a shorter and more understandable manner. This sets up the increased likelihood of getting a response that will benefit you more. Your coach is there to get you the result you desire. He/she is the one in your corner in this fight. Your coach cares about you (or at least they should if they are any good). realise that both you and your coach are only working for YOU. Of course the coach benefits both financially and from an ego sense in knowing that he/she helped you to reach an amazing goal but your coach is only there to help you. The most counterproductive thing you could do as a client is not work hard and cooperate with your coach as it would be self-sabotage. Keeping to agreed times for Skype calls, check-ins, updates, etc. is one of the most helpful things you can do for your coach. 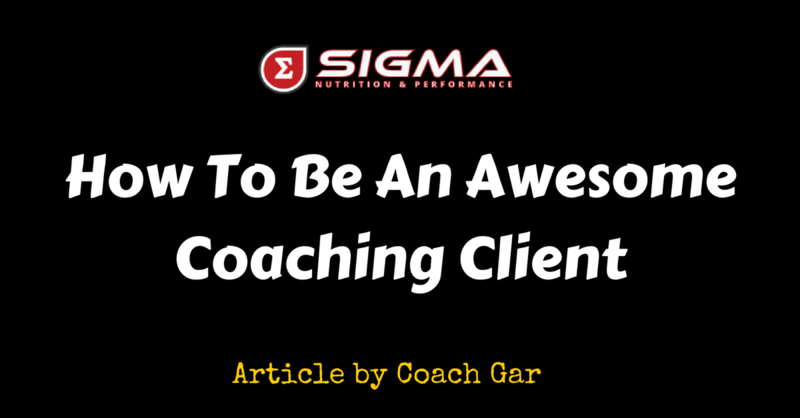 As an example; we ask all of our coaching clients with us at Sigma to have their weekly check-in emails delivered by Sunday night. This allows the coach to hit Monday morning with all the required information to start making tweaks or offering feedback ahead of the coming week. If this email is late, then so is the response, and so the coaching interaction is delayed. Plus, being on time with things is just good manners, right? Match your coaches work-ethic. Our coaches work extremely hard for our coaching clients. In addition to the times interacting, time goes into thinking about their progress, coming up with solutions to issues, monitoring their tracker each day, researching questions that we need better answers for, etc. If you do end up working with a competent coach, then don’t waste that opportunity. Match your coaches work ethic and you will accelerate the rate at which you progress. When I Skype someone for their initial consultation at Sigma, I tell them put their game face on for every single day over the next few months. Sure everyone will have a few off days but for 95% of the time make sure to stay interested, engage with your coach and learn why changes are being made and make the most of your coaching process so you come out the opposite side not only with a result but also with an education and the necessary tools to continue in any direction that you want. Your coach will probably have a lot of similar ideas to what you thought would be in your plan but he/ she may also have some ideas that you might not have tried before or that you might have a bias against. If your coach can explain to you in a logical way his/ her rationale for putting something in a program and there is ample literature to back it up, then try it. Trust your coach. Believe in the process. And remain open to new approaches. Sure there will be weeks where you see big changes but there will also be weeks when progress towards your particular goal will be slower than others. Embrace that from the start and always think of the big picture when that slower time comes around. Realistic time-frames on goals give you the chance to view progress over weeks/ months before you start on your designated program. Being able to see rough ideas of what’s coming is a huge motivating factor. My last point is the most important point of all. Pick the correct coach. All of the above is rendered null and void unless you pick a coach that is right for you. It may seem like a simple one but in an online world full of choices, you don’t have to produce credentials or even results to gain popularity. Most people then equate popularity and social followings to intelligence and competency and end up choosing a coach who is unable to properly carry out their duties. Choose a coach who is reputable, who can produce relevant qualifications and has proven themselves with various clients before.